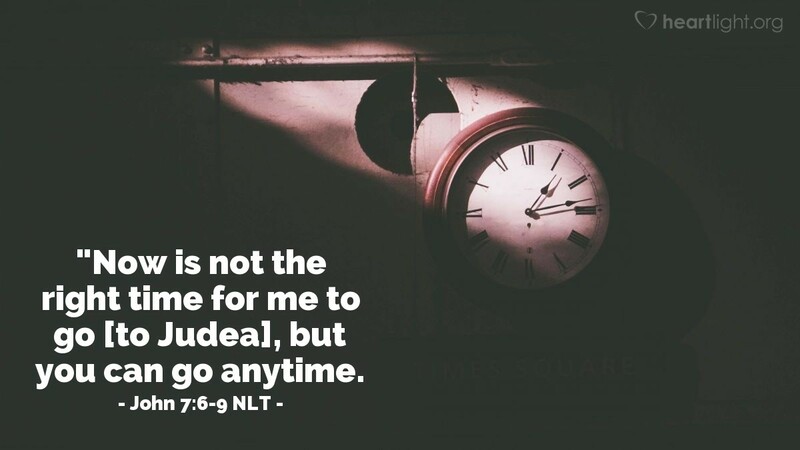 Jesus replied, "Now is not the right time for me to go [to Judea], but you can go anytime. The world can't hate you, but it does hate me because I accuse it of doing evil. You go on. I'm not going to this festival, because my time has not yet come." After saying these things, Jesus remained in Galilee. So much is not said today because of the political correctness police. That observation is not intended to give us an excuse for prejudicial or bigoted speech. Instead, my concern is our culture's reluctance to call sin "Sin!" is my concern. Jesus didn't leave just happy and healed people in the wake of his ministry. Some of the folks he passed by reappeared later in the story crying, "Crucify him!" They didn't like it when he called their evil what it actually was. Some of us apparently do not like it either. Evil is still evil. Sin is still sin. And wrong is still wrong. Truth often makes us uncomfortable with our sin and hopefully will lead us to change. Unfortunately, many don't want to be brought to the light of the truth. Jesus was crucified for several key reasons, but we must realize that one of those reasons was simply this: Many people, especially religious people, don't like being told they are sinners. And, if we are the ones doing the telling, we must remember to do it with love and humility, realizing that we are sinners in need of repentance and grace, too. Father, please give me greater wisdom so that I can demonstrate your love with compassion while at the same time standing up for your truth and righteousness. While I know others may not understand my faith, strengthen me through your Holy Spirit so that I will stand faithfully no matter how great the opposition and no matter how close to home that opposition might be. In the name of Jesus. Amen.